Korea has a unique healthcare system that has been rapidly settled down and widely applied, contributing to great improvement in the health level as well as the health equity of all citizens. Since 1989, all Korean citizens have been covered by universal health insurance. As a mandatory social insurance program, all citizens are obliged to join the National Health Security System, which is composed of National Health Insurance and Medical Aid, and is overseen by the Ministry of Health and Welfare. Therefore, we were able to analyze baseline medical data including the incidence, prevalence, and mortality rate among patients starting dialysis therapy with a complete enumeration survey using claims data from the National Health Security System. To date, only a few large-scale studies have measured the effect of dialysis modality on mortality in Asian populations. In this study, the Korean Health Insurance Review and Assessment Service (HIRA) database was analyzed, and survival between incident hemodialysis (HD) and peritoneal dialysis (PD) patients was compared. We were able to perform a population-based complete survey that included 32,280 incident dialysis patients. During the median follow-up period of 26.5 months, 6479 patients undergoing HD (26.6%) and 2156 patients undergoing PD (27.4%) died, which corresponded to a death rate of 112.5 and 112.3 deaths per 1000 patient-years, respectively. The 1-, 2-, and 3-year survival rates of HD patients were 87%, 78%, and 72%, respectively, and those of PD patients were 90%, 79%, and 71%, respectively. Survival analysis using Kaplan–Meier plots showed that there was no difference in the unadjusted mortality rate between HD and PD patients (Figure A). However, in order to address the concerns that these results were probably influenced by a large heterogeneity in baseline characteristics between HD and PD patients, we matched 7,049 patient pairs with similar propensity scores. Using the log-rank test, we found the mortality rate in PD patients was significantly higher than that in HD patients (Figure B). Subsequent subgroup analyses indicated that in older patients (55 years and older), with the exception of the subgroup of patients with no comorbidities and the subgroup of patients with malignancy, PD was consistently associated with a higher mortality rate. 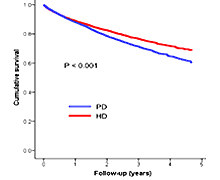 In younger patients (under 55 years), regardless of the covariates, the survival rate of PD patients was comparable to that of HD patients (Figure C). Thus, while the overall mortality rate was higher in incident PD patients, mortality rates of some incident PD and HD patients were comparable in Korea. Our results revealed that survival in PD patients was worse than survival in HD patients, in contrast to other studies including Western patients. This could be related to differences in ethnic background and/or medical environments, such as reimbursement policies. Regardless, we need to know the current survival rate of Korean dialysis patients in order to improve it. Obviously, kidney doctors are still fighting to achieve a better survival rate for their patients. Dialysis patients suffer from 2.5-fold higher mortality than cancer or stroke patients and 2-fold higher mortality than heart attack patients. Koreans are different from people of other countries in many ways. This is the very reason that we should develop our own healthcare strategies. HIRA and NHIC databases are now open to the public and more easily accessible than ever before. I’d like that Korean researchers would conduct more studies employing big data. Figure. Kaplan-Meier survival curves in all patients initiating dialysis (A) and in propensity-score-matched groups (B), and hazard ratios for patient survival (C).